Our 45 Degree Branch's are manufactured using only the highest quality galvanised steel. The 250mm refers to the branch. Please use the drop down box to select the size of pipe required. 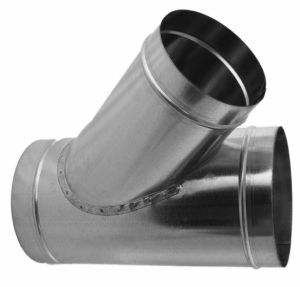 The Branch on Pipe can be either Large End or Small End, depending on whether you require a Spiral Pipe or a Bend to fit into the branch. If you require a bend to fit into the end of the branch then select LE alternatively if you Spiral Pipe to fit onto the branch then please select SE. If no selection is made then the branch will automatically be made SE to suit Spiral Pipe. We can manufacture these angle branches in other angles upon request.